A typical homeowner might use their garage door more than a thousand times every year. That's at least twice a day, which is the bare minimum for the majority of households. 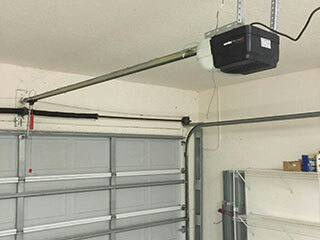 It’s easy to understand, then, the stress that the average garage door opener undergoes. Because of this constant use, it may develop ongoing issues that require professional attention. Some common problems include slow, noisy or inconsistent operation, jerky movement or sudden stops. Wear and tear is the number one cause. Motor gears can wear out and stop working correctly, which will keep your opener from being able to open your door at all. The interior circuit board can also be a culprit, as even one detached or frayed wire can render the entire unit inoperable. Contrary to what many homeowners believe, the opener itself does not take the weight of the door - the springs do that. As a result, the motor isn’t designed to bear a heavy load, and if other parts put it under increased pressure it can quickly become damaged. Our company keeps a wide variety of garage door openers in stock and our team of professional technicians can advise you on the right choice for your garage. Once you've made an informed decision, our experts can quickly and safely install your new opener, and carry out all the necessary tests to ensure all of its features are fully functional. Whether you’re looking for a brand new opener or need some help with your old unit, our team at Garage Door Repair Plainfield is ready to help you. Call us today to find out what we can do for you.